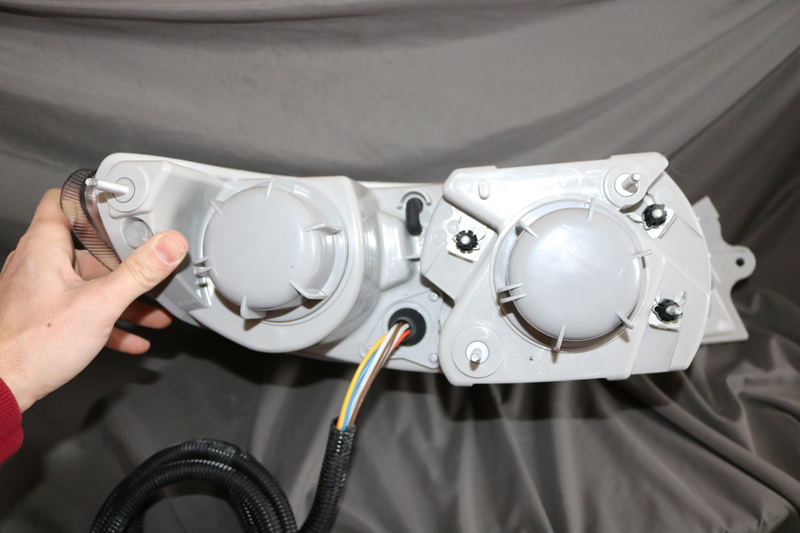 Ballast, bulb, and wiring harness are all completely inside the light housing. Everything pre-installed in the light housings before they’re shipped to you! The OEM International lights suffer from the same problems as many others. The optics have been around for some time, and lighting technology has improved a lot in that time. The transition from reflector-based optics, which were the norm in the 1990s, to projector optics is alone a big improvement, but we also make that upgrade to a high quality bi-Xenon projector for the best lighting system possible. 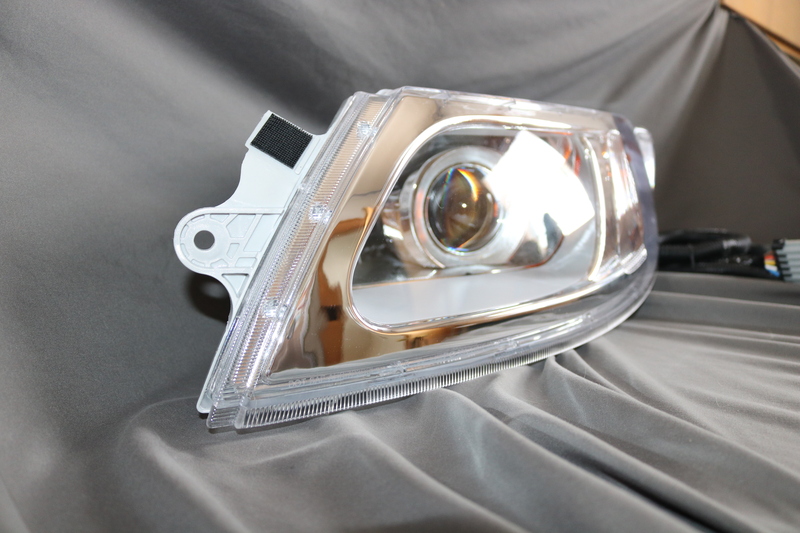 Many HID retrofit kits use generic components, matching only a bulb base. Others include wiring harnesses that just adapt from one bulb type to another. Included ballasts are often of poor quality, and have trouble starting quickly, restarting hot bulbs, or have slight flickers that can be bothersome. They’re the type of kits that NHTSA has ruled can’t be made to meet the performance requirements in FMVSS Standard 108. This kit is different. Putting those so-called plug-and-play kits into your existing housings isn’t just illegal–it blinds other drivers while only marginally improving your vision. To use an analogy, all you’ve done is upgrade to a bigger caliper weapon, instead of aiming at a target. When you replace the light optics, you get a lot better performance in terms of seeing the road, but you also do it without creating glare for other drivers. By doing it the right way, we’re also using a standard Xenon bulb–you can find a replacement bulb at just about any parts store should you need one (though life expectancies far exceed a normal halogen bulb). How does this work? What are the two options available? Since this operation requires modifying the light housing, we offer it two different ways–either complete, where we start with a brand new set of headlight housings, and install our package before shipping to you, or on an exchange/upgrade basis, where we modify the lights you already have. This is the simplest, but more expensive. 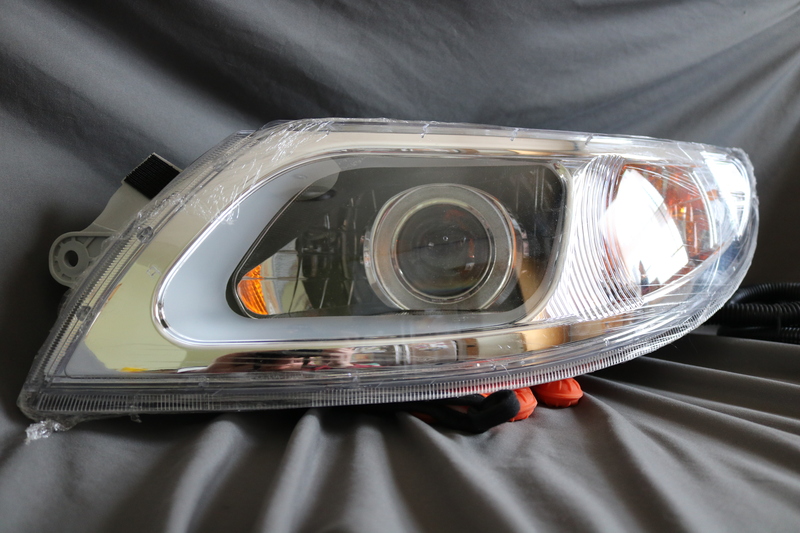 You simply place your order, and we ship you a set of new lights ready for installation on your International truck. You’ll only need to remove 3 bolts and 2 electrical plugs to swap each one out. If downtime is critical, or if your light housings are hazy or otherwise damaged, this is the way to go. This option is less expensive, as we don’t need to get new housings for you. After you place your order, we’ll contact you with shipping instructions, and coordinate scheduling. When we get your lights in, we’ll turn them around within 48 hours, via Priority Mail (for US addresses). This means that typically the lights are back in your hands in less than a week. We’ll always ship your lights back to you–this isn’t a typical core-return arrangement where you may end up with someone else’s lights. We don’t ever want to leave you underwhelmed by a set of housings with weathering or other defects–by returning your lights to you after the upgrade, there’s no discrepancy or charges/credits to account for differences. Of course, if we get your lights and notice a significant problem, we’ll address that with you before proceeding with installation. What about fleets, or other arrangements with multiple trucks? If you manage a fleet, or want to coordinate a group of fellow truck owners (particularly other RVers), contact us. The most common arrangement is to start with a complete set with housings, install those on one truck, and then send in the take-off housings for upgrade. Basically, you introduce one new set of housings into the fleet, yet are able to upgrade the rest of the fleet with no downtime. Of course, there are certainly other ways to go about this, and we’re glad to work to accommodate your needs. Approximately 30 minutes for both sides. All International 4300, 4400, 8600, and Transtar trucks. Available now. Usually ships in 3-5 business days.